Grass Valley, Ca is one of my favorite towns in the Golden Hills area of the California Sierra. From Auburn , just cross the Bear River, then drive about 25 minutes north on Highway 49! The “Bear,” also known as the Rio Oso, is the county line between Placer and Nevada counties. Coming home from an excursion down in the “flats” of Roseville or Sacramento, I always get a smile on my face when I cross my “Bear.” I know that home is just a few minutes away, and the scenery is beautiful. Grass Valley is quieter and more “town-like” than Auburn. It’s has that “gold rush” look along main street, but it is a working-man’s town. You can buy a hammer or a pair of boots here. Ironically, it has more privately-owned bookstores per capita than any other town in California. I would mention my favorite bookstore in Grass Valley, but the truth is, I have three! And there is ne’er a Barnes and Noble nor Borders anywhere in Nevada county. Well, maybe up in Truckee, but those snowbirds can speak for themselves. There are a lot of things to see, and a lot of things to do in grass Valley. There’s a thriving arts community, a drop-dead gorgeous state park called Empire Mine , classical music, rodeo, farmer’s markets, street fairs, festivals of all kinds, an art deco movie theatre to die for, and a bunch of good restaurants where you can eat well without going broke. Downtown you can buy a cute little Victorian house or, moving outward from the center, you are soon find rural and semi-rural homes, farms and ranches. Your housing budget goes a long way in Grass Valley. Homes are typically below the median price for the county and WAY below the median price for homes down in the flat lands. One thing to keep in mind if you are searching for a home in “Grass Valley.” That term describes the little township of 11,000 people that we have been discussing, and also a very large rural area that surrounds the town. 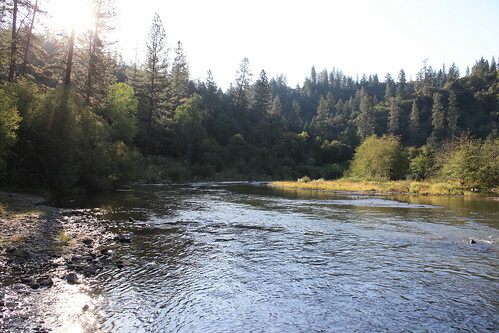 The “area” of Grass Valley is many miles across and many miles deep, extending down almost to the Bear River. There’s plenty to choose from, and how rural you want to go is entirely up to you!